The Rocky Mountains Have A Dust Problem Dust in the Rocky Mountain snow can cause elevated water runoff, and greater opportunities for forest fires. Jeff Derry, director of the Colorado-based Center for Snow and Avalanche Studies, digs a snow pit at the Swamp Angel monitoring site in the San Juan Mountains. A menace lurks beneath the snow high up in the southern Rocky Mountains: dust. Lots and lots of dust. This dust speeds up spring water runoff, causing intense melting and streams to peak weeks earlier than usual — which wreaks havoc throughout the alpine ecosystem. Water managers and fire forecasters alike are sounding the alarm about the consequences of less water flowing in streams and reservoirs. At first glance the dust seems innocuous. How could something so simple undermine water infrastructure, stress wildlife and lengthen the wildfire season all at once? For most of the winter, dust stays buried under blankets of snow. Then, as the days grow longer and the sun's rays begin to melt the top layers, it begins to show. To see the dust before this happens, you need to dig a snow pit. In the spring, Jeff Derry can often be found waist-deep in one of these pits, somewhere in the southern Rocky Mountains. 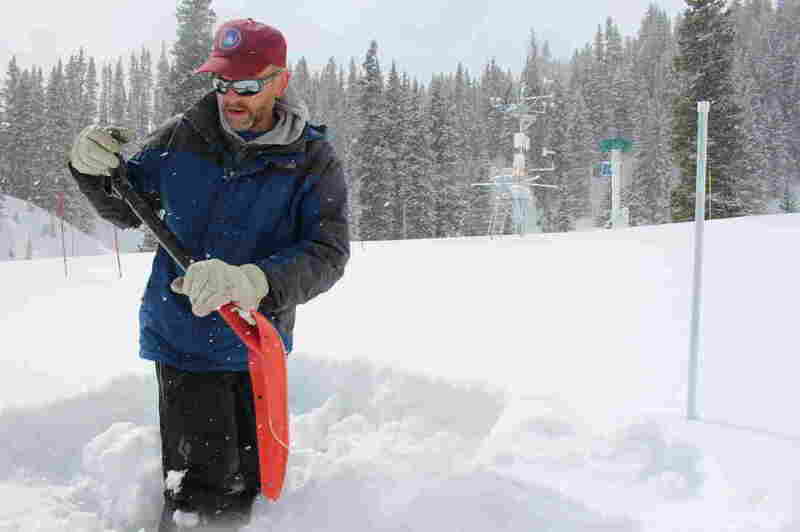 Derry, the director of the Center for Snow and Avalanche Studies in Silverton, Colo., pays close attention to the amount of dust that winds up embedded in snow. Snowpacks — layers of snow that accumulate in regions that are cold for most of the year — in the Colorado River watershed are at record lows. These snow pits are like the rings of a tree: They tell a story. If you dig deep enough, you see the entire winter's timeline through of layers of snow — reminders of each storm that's built the snowpack. When Derry digs pits, he's on a fact-finding mission. "I'll be curious if you're going to be able to see the dust event we had Feb. 18 and 19," Derry said one day in April, shoveling snow over the edge of a half-formed pit. "It is very subtle." Derry uses a range of instruments to pull details from the pits, each fine-tuned to measure snow qualities such as temperature, density and reflectivity. But the best way to gauge the magnitude of a dust layer is with the human eye, Derry said. 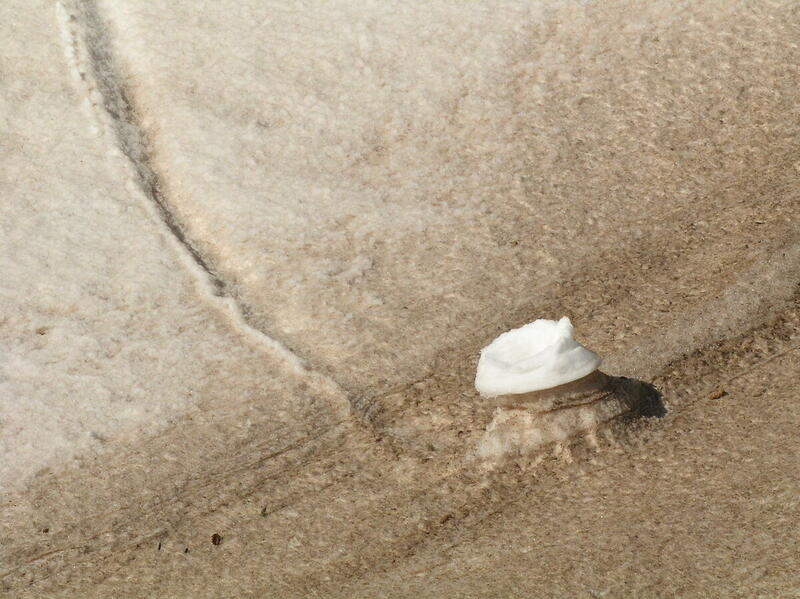 White snow melts slower than snow covered in dust because of its high albedo, or reflectivity. It reflects radiation from the sun rather than absorb it. "It's very qualitative in a sense," he said. "You go out, you look for it, you dig, you see what you see." In Derry's current cross-sectioned snowpack, about 7 inches down, is a beige-colored band of dust. This tiny little strip of dust has the potential to upend how water is managed in the West. Eventually, Derry says, this snow will melt and empty into the Colorado River. Its watershed provides water for some 40 million people in the southwest. When there's no dust on the snow, it's brilliantly white: On a sunny day, this kind of snow can be reflective enough to cause eye damage. Without dirt or dust, the snow melts off slow and steady — like the drumbeat of a drip from a faucet. 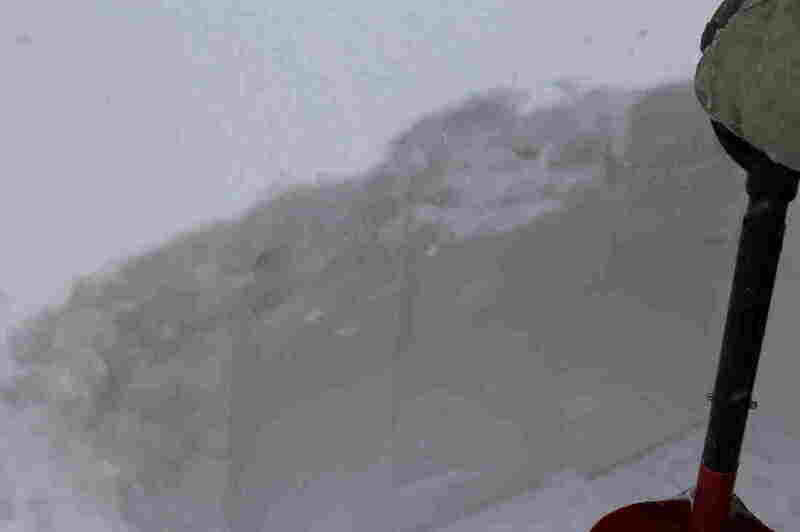 Dust causes the snow to get darker and absorb more sunlight. "It melts the snow faster than it would have otherwise," Derry says. "And then it melts down to the next dust layer, and so on and so forth until all the dust layers have combined at the surface of the snowpack greatly reducing the [reflectivity]." When these dust layers combine, the sun's radiation quickens the pace of runoff, making it all that more difficult to capture and divvy up the precious water. This quickened runoff makes managing water harder and upsets mountain ecosystems, causing earlier green up of vegetation. And when snow melts earlier, wildfires have more opportunity to spark and take hold. Most of the dust that's settling in places like the San Juan mountains comes from the desert southwest, from land disturbances like farming, oil and gas drilling, cattle grazing, recreation and residential development on the southern end of the Colorado Plateau. "It's kind of a slow crisis, a slow disaster," said Rich Reynolds, an emeritus researcher with the U.S. Geological Survey in Denver. "It's not like a hurricane. It's not like an earthquake or a volcano." In the past 50 years, as the Sun Belt boomed, scientists recorded a dramatic rise in the amount of dust being deposited on snow — which forces fundamental changes in how spring runoff occurs. Reynolds says reversing this trend won't be an easy task. "There's no one size fits all in terms of mitigation for these kinds of source areas," he said. "Plus, these are large, large areas." In a 2010 study researcher, scientists found that in heavy dust years, the Colorado River's flow on average peaked three weeks earlier than in years without heavy dust deposition. The same study also found that earlier melting snow reduces the amount of water that runs to the Colorado River by about 5 percent. That's more water lost than the entire state of Nevada uses from the river in a year. And then there's climate change. University of Utah hydrologist McKenzie Skiles recently co-authored a study that examined whether warmer temperatures or dust are greater threats to snowpacks. "What we found looking at those two in this region, is that it was actually dust that controlled snowmelt timing and magnitude and sort of how fast snow ran out of the mountains, as opposed to temperature," Skiles said. "We didn't see any relationship to temperature at all." Warming temperatures are more likely to affect and diminish total snow accumulation, causing some snow to come down as rain. But when it comes to runoff, dust is the controlling factor. It's the sun's rays that force snow to melt, not outside air temperature. While science is beginning to paint a clearer picture of how this phenomenon plays out, Skiles says that there's plenty the field doesn't know about dust. "We still have some questions on what controls the actual dynamics of the dust events themselves," she said. "We see dust in every year, but there's a high variability between the amount of dust that's deposited each year." Back in the San Juan mountains, Derry says he's bracing for more dust events this spring. The mountain range has registered five dust events since October. Derry says the San Juans are ground zero for this problem. And because they're a key part of an already overtaxed Colorado River system, he says everyone in the seven U.S. states and in Mexico that depend on the river should be concerned. "We're located at the headwaters of four major watersheds," Derry says. "And our mountain systems are undergoing change at a fundamental level." Change that could make the West an increasingly dry — and dusty — place. NPR's Emily Sullivan produced this story for digital.